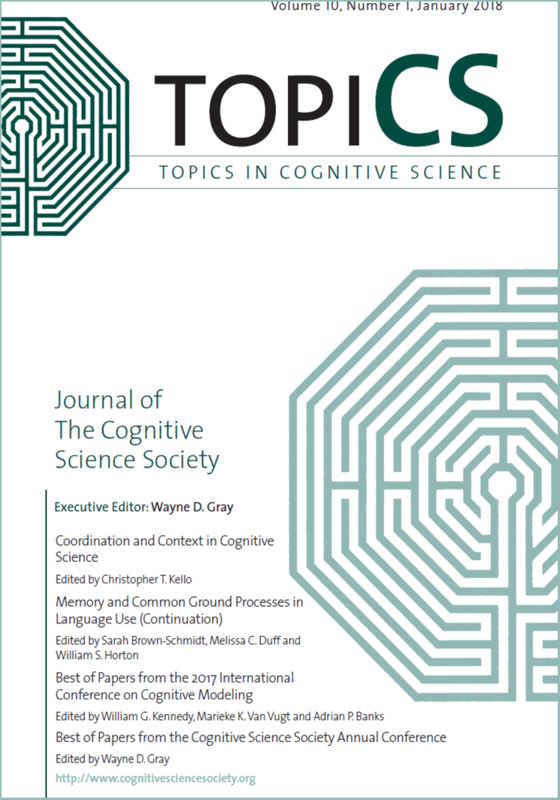 The Cognitive Science Society began publication of Topics in Cognitive Science(TopiCS) in 2009. The TopiCS Journal App is available from the Apple app store. The New York Times features a TopiCS article. Editorial Introduction is here. “Cognitive Science” is a premier outlet for innovative research and theory, and “Topics in Cognitive Science” provides a unique venue for collections of papers that focus on new and emerging topics or which are a bit “off the mainstream” but of broad interest. A. Use the published PDF of their article immediately with no limitations on personal use (of course, commercial use is something else entirely). B. Post the final, electronic versions of the PDF produced by our publisher, Wiley-Blackwell, immediately, on your personal websites. Furthermore, the contract we have (and have had since 2008) with Wiley-Blackwell, provides the Society the right to post the final, electronic versions of each issue of both Journals on our archive site after a 3 year embargo. This means that all of our content can be downloaded for free by anyone (members or not), anywhere in the world.